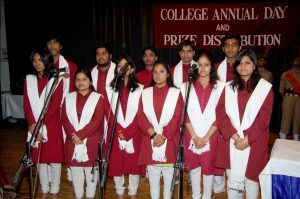 Zakir Husain Delhi College held its Annual Day and prize distribution function in the college auditorium on 12th April, 2016. Shri. 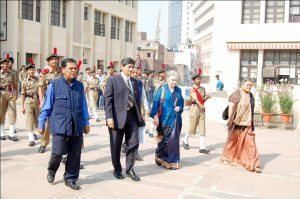 Chandi Prasad Bhatt, noted environmental activist and Padma Shri awardee, was the chief guest on the occasion. The Principal, Dr. Prabhakar Rao presented the Annual Day Report which highlighted the activities of the various departments and societies in college as well the individual achievements of faculty members. Shri. Bhatt made an detailed presentation on the ecological changes that have taken place in the Himalayan region and stressed on the need to undertake environmental conservation in the region. He also noted the contribution of a former faculty member of the College, Prof. Virender Kumar in environmental conservation of the region and urged the students and academicians to contribute towards this area. The annual day of Zakir Husain Delhi College (M) was held on 30th March 2015. The Chief Guest for the occasion was the distinguished cricket commentator and Padma Shri awardee Mr. Ravi Chaturvedi, who was a Botany professor at the College till his retirement. He addressed the gathering with a nostalgia about the past and took pride in the achievements of the students and faculty members, while congratulating them for the same. He recalled his days as a student, and as a professor in the College via the medium of anecdotes which reflected on the traditions and values of the institution.